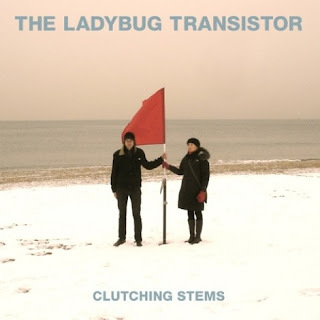 The Ladybug Transistor are a group around Gary Olson who are making indie pop music. In general they are inconspicuous, easy listening songs and many won't ever have heard of this band. Yet they already have released six albums since 1995, but never managed to break through. In 2007 disaster struck with the death of drummer San Fadyl. Eventually they found a replacement and the band was reinforced with some new members. Now here's album number seven Clutching Stems. And again they are relaxed pop tunes that are easily digested. The instruments and vocals are clear and the production is perfectly fine. Olson's vocals are sometimes vaguely reminding of Morrissey of The Smiths. The music however lacks courage and sharpness. It never gets exciting or are they trying something new. All tracks are complete songs, with a clear head and tail. But they are all written following the same recipe. With so many musicians in a band, you would expect more variation. But the arrangements and compositions are too easy and hardly noteworthy instead. It does have some nice songs. 'Caught Don't Walk' has a pleasant horns part that makes it a bit different. 'Hey Jack I'm On Fire' has a change in tempo compared to most of the songs. But there are hardly any songs that stick out. And this makes the record quite weary and even boring after a few plays. Maybe nice to play in the supermarket, so no one will get annoyed, but hardly an album to put on at home to enjoy. The seventh one of The Ladybug Transistor didn't turn into a new start. It's just the one of many volumes in a bouquet series. It's easy listening but with little to enjoy. It looks pretty tasteful on your plate, but in your mouth it turns out to be a tasteless bite. Maybe the band just hasn't anything more to offer. I don't think a break through will happen any time soon.